You don’t need to deal with cash or get exact change. There’s no need to write checks and reorder more when you run out. You get an electronic record of transactions, helping you remember (and prove) how much you paid, and when. Popmoney works well as a person-to-person (P2P) payment service with people you know and trust. PayPal can handle P2P payments, and it’s also useful for shopping and paying strangers around the world. Besides those two popular services, there are several other ways to send money to people. For example, Zelle is a relatively new option, compared to PayPal and Popmoney. It’s typically free, and you might already have included with your bank account. Fees are pretty modest with either Popmoney or PayPal. The cost is typically worth it when you consider postage, the cost of checks, and the value of your time. Still, you should know what you’re paying and if the costs make sense. If you make frequent, small payments, watch out for per-payment fees that can add up. PayPal is generally free for personal payments as long as you draw from your bank account (as opposed to funding with a debit or credit card). PayPal should be free for payments you make to a business (when you shop online or at a brick-and-mortar merchant). PayPal charges fees when your business receives payments from customers. Popmoney is generally free when receiving money. 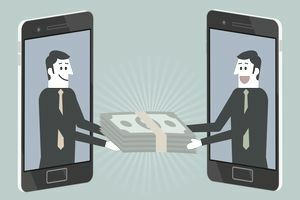 Your bank may charge a small fee for sending money via Popmoney ($1 or so per payment). Sending money from your account at Popmoney.com costs $0.95. Requesting money from somebody at Popmoney.com costs $0.95. But receiving funds is free if the other person initiates the transaction without you requesting money. Naturally, there are additional fees in certain situations. For example, PayPal charges extra to businesses when chargebacks happen. If you’re concerned about costs, read the fee disclosures for each service carefully. And if you hate fees and just want to send money to friends and family, look into Venmo, Square Cash, and Zelle as alternatives. Just about anybody with a bank account can use PayPal or Popmoney—which is one more reason to open a real bank account if you don’t already have one. Originally, sending money with Popmoney was only available to customers at participating banks. Now, anybody can sign up and create a profile at Popmoney.com using a payment account at any bank. Checking, money market, and other transaction accounts work with Popmoney, whether sending or receiving money. Savings accounts do not work because federal regulations make savings accounts unsuitable for payment services and frequent withdrawals. You can also send money from a debit card account. Popmoney advantage: If your bank works with Popmoney, life is a little easier—you don’t have to set up a profile or provide bank information at Popmoney.com. Instead, just log in to online banking and use Popmoney from there. If your bank doesn’t use Popmoney, there’s a good chance it uses Zelle. PayPal advantage: Not everybody uses a bank or credit union that partners with Popmoney, but PayPal accounts are widespread. Your friends might not want to set up a new account at Popmoney if they already use PayPal accounts or other services. Which is Best for Shopping? If you plan to shop online (or even with select brick-and-mortar stores like Home Depot), PayPal is the better option. Retailers and online merchants often offer PayPal as a payment method. In some cases, it’s wise to pay with PayPal. When buying from a website that you don’t know anything about, it’s scary—and risky—to provide your credit or debit card number. With PayPal, you keep those numbers safe, and the vendor only sees your username or email address (and possibly your delivery address). Both Popmoney and PayPal use state-of-the-art security to keep your money and personal information safe. That said, data breaches happen, so it’s worth keeping track of your accounts and reporting suspicious activity as soon as possible. When buying from a merchant—or a stranger on the internet—PayPal has “buyer protection” for certain transactions. That’s helpful if there’s a dispute with the seller or your goods never arrive. Popmoney does not offer buyer protection, and thieves have used the service to take advantage of people (who send money and get nothing). Don’t send funds with Popmoney unless you really know where the money is going and you trust the other person (the same goes for Venmo). Popmoney only pulls funds from your bank “transaction” account (checking and money market accounts, for example). You can also link your debit card, which pulls funds from checking. PayPal can link to your bank account, as well as credit cards and debit cards. You can also spend from your PayPal balance (if you keep money in PayPal), and there are several options for adding to your PayPal balance. For example, you can use money that others pay to your account, or you can deposit cash at certain retail stores.